customization to the shower experience. GROHE Rainshower™ SmartControl uses a double button design allowing the user to control and set all desired shower settings. A combined push-and-turn button starts the flow of water and controls water volume. The textured edges of each button mean the user can easily control settings even with wet fingers. All controls are marked with symbols for intuitive operation, making this modern shower system easy to use. GROHE SmartControl is also equipped with GROHE TurboStat® technology, a metal thermostat handle that delivers preferred water temperature to the user within fractions of a second and keeps the temperature consistent for the duration of the shower. A SafeStop button prevents users from inadvertently raising the water temperature to more than 100 degrees Fahrenheit and GROHE CoolTouch® technology removes the risk of scalding by preventing the exposed metal surfaces from heating up. GROHE TurboStat® and GROHE CoolTouch® are registered trademarks of GROHE AG. 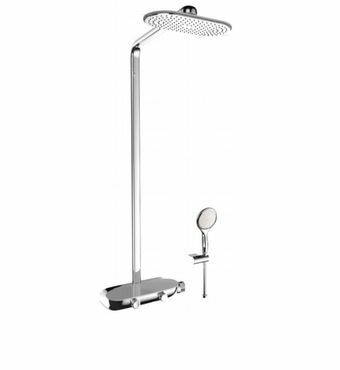 GROHE SmartControl™ and Rainshower™ are trademarks of GROHE AG.